I really, really like this book. It is only half a graphic novel: chapters alternate between text and comics, Judy taking care of the prose, Paul the strips. I am an old, world weary cynic, but this book tugs at my corroded heart strings. 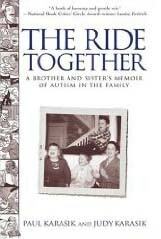 Warm and happy and sad and gentle, it is the story of Paul and Judy’s elder brother Dave, who has autism. Dave is loved by his family but can be a handful, violent at times and the book follows the families attempts to find Dave an appropiate caring community in which he can live, be himself and make the most of his life. Dave embarrases them in public sometimes, until they realise that it is their own reaction to his behaviour that is the most embarrasing aspect and that he is sometimes useful to them as a convenient excuse for getting out of unenjoyable social engagements. The parents, Monroe and Joan are active in working for people with learning disabilities, and want the very best for David. Unfortunately it turns out that what they thought was the best placement for him, a community in which he has lived for 15 years, turns out to have been a hotbed of physical and sexual abuse. This thread of the narrative is an understated one, by far the most tragic aspect of the work yet not dwelt upon mawkishly, but it raises painful questions about the vulnerability of adults with disabilities and the sinister motivation, or just the plain bad attitude, of some careworkers in what should be places of safety. The scandal of abuse is discussed in a sober fashion, as a trajedy of good intentions gone wrong, rather than using the hysterical language we are so used to reading in the tabloids or hearing from the mouths of politicians. This is not a misery memoir, the greater part of story has a celebratory feel to it, relating David’s idiosyncratic behaviour and mindset. He is lucky to have such a family, and in turn he brings them joy as well as worry. Paul Karasik worked on the graphic adaption of Paul Auster’s City of Glass. His straighforward graphic style has an honesty about it, slightly rough, with the pencilling still occasionally visible beneath the ink. Judy’s prose exhibits a similar candor. The unusual format of alternate chapters and joint authorship work well, and the work is self reflexive in the best tradition of “art comics”. It has a hopeful, happy end too.